ANASSESS Contents 1. Introduction 3 2. Historical and Legal Basis 3 A. Treaty of the European Union B. Case Law C. Three Directives 3. Requirements and Scope of Directive 98/5/EC 6 4. 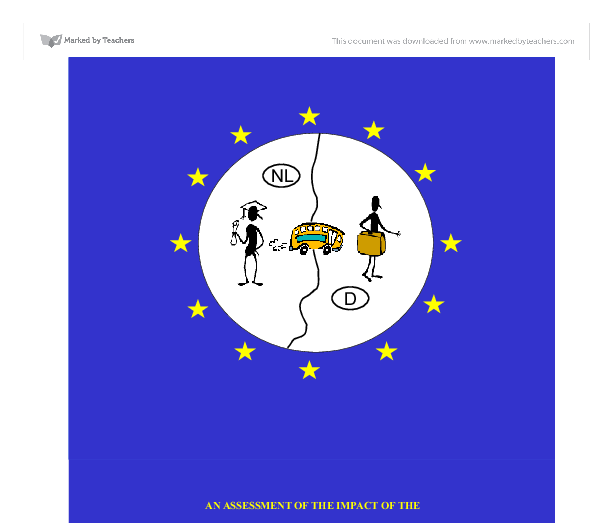 Impact of the Directive on the Market for Legal Services 7 A. Statistics and Trends B. Economic Approach C. Competition vs. Regulation 5. Conclusion 11 6. Bibliography 11 7. Endnotes 14 Appendix: 'Community' lawyers per host Member State 17 1. Introduction Many lawyers and their business clientele view the European market as a single entity. The relative success of market integration has created demand for cross-border legal advice and cooperation1. Lawyers have a legitimate business interest in seeking the capacity to provide a one-stop shop to meet these legal needs2. Some lawyers, in seeking to accommodate this need, have tried in the past to establish a presence in other Member States. In some cases their right to do so, in any manifestation, was challenged; in other cases, the scope of their legal or marketing activities was hampered or rendered untenable3. Lawyers themselves recognised these difficulties for many years, and worked within the Council of the Bars and Law Societies of the European Union (hereinafter referred to as "CCBE") to cooperate and present a draft proposal for adoption by the European Commission, addressing issues of lawyers' establishment. The CCBE proposal was finalised in Lisbon in 1992, after a long and contentious debate. The Lawyers' Establishment Directive4 is designed to facilitate the permanent practise in one or more Member States of professionals qualified to practise in another Member State. Once the Directive is adopted into the Host State's law, this means that those qualified in their Home State to practice law are entitled to give advice and practise legal activity in the law of the Host State, subject only to circumscription as delineated within the Directive. This paper considers the implications for behaviour in legal services markets in the EU pursuant to the implementation of the Lawyers' Establishment Directive. ...read more. The breadth of such restriction varies amongst jurisdictions, though in most Member States the right to represent others before the courts is restricted to members of the designated professions. Designated titles are restricted to members of professional bodies in all EU Member States. Successful completion of a specified period of study of the law at university together with the passing of one or more professional examinations[WL4] and a period of training under an experienced member of the profession is usually required to obtain the right to practice under such titles in most Member States. The traditional restriction on advertising by members of the legal profession has been relaxed in a number of jurisdictions in recent years; for instance, in Germany, advertising has historically been prohibited, but current regulation permits informative advertising. With respect to fee regulations, different jurisdictions handle the matter in different ways. Fees for both main branches of the legal profession in Scotland, England and Wales are determined by the market as are those for advocates and barristers. In Spain the local bar produces scale fees based on the value of the transaction, but it appears that the actual method of determining the fee is a matter of negotiation between the parties. The State lays down the minimum fees to be charged by German Rechtsanwaelte on the basis of the value of the transaction. Speculative fees, also known as contingency fees - the foregoing of fee if the action is lost - are prohibited in Germany and Belgium, and for barristers in Northern Ireland. Stephens' research indicated that the jurisdictions where legal services markets are aligned most closely to the competitive ideal are likely to be Finland and Sweden, possibly followed by Scotland and England and Wales ("efficient" markets). At the other extreme, Germany still has regulated fees, and Spain has only recently permitted advertising ("inefficient" markets). 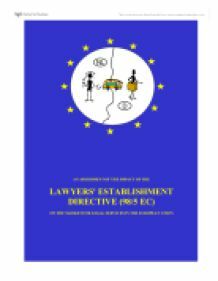 However, Directive 98/5/EC has tended to liberalize the market by clearly establishing the right of law firms to set up branches in any other Member State, and such firms can be staffed by both Host State and migrant lawyers. ...read more. 32 Stephen, F "The European Single Market and the Regulation of the Legal Profession: An Economic Analysis" (2000) http://www.economics.strath.ac.uk/pdf/rw_fs7.doc [downloaded 20 March 2003]. 33 Monti, M "Competition in Professional Services: New Light and New Challenges" (2003) http://europa.eu.int/comm/competition/general_info/invitation/en.pdf [downloaded 12 April 2003]. 34 Monti, M "Competition in Professional Services: New Light and New Challenges" (2003) http://europa.eu.int/comm/competition/general_info/invitation/en.pdf [downloaded 12 April 2003]. 35 Case C-35/99 Arduino E.C.R. I-1529. 36 Case C-309/99 Wouters E.C.R. I-1577. 37 Paterson, I, Fink M, Ogus, A et al., (2003) "Economic impact of regulation in the field of liberal professions in different Member States", http://europa.eu.int/comm/competition/publications/prof_services/prof_services_ihs_part_1.pdf [downloaded on 12 April 2003]. 38 European Commission Competition DG, "Commission Services Working Document, Regulation in Liberal Professions and its Effects, Invitation to comment" (2003) http://europa.eu.int/comm/competition/general_info/invitation/en.pdf [downloaded 12 April 2003]. 39 Even the prospect of a single academic legal qualification for all lawyers within the EU has recently been advanced. In an opinion of the advocate general of the ECJ, Christine Sixt-Hackl, dated 20 March 2003, it was said that "Member States must make an assessment as to whether (foreign legal qualifications) are equivalent to (those) in the host country. A refusal to do (so) is illegal". The case regards a French trainee who wishes to become an Italian trainee lawyer without having to complete an Italian law degree. A Brussels-based Law Society International representative indicated that if the ECJ upholds the opinion later this year, it could open the floodgates to graduates seeking to finish their training in other jurisdictions. UK Legal News, 'ECJ paves way for EU legal qualification' http://www.legalweek.net/ViewItem/asp?id=14172 [Downloaded 14 April 2003] 40 European Commission Internal Market, "Lawyers: Mr Monti welcomes adoption of Directive" (1997) http://europa.eu.int/comm/internal_market/en/qualifications/1128.htm [downloaded 8 April 2003]. Appendix: 'Community' lawyers per host Member State Last update: August 2002 [WL1]Suggestion: change in "Three" Directives [WL2]Uses? [WL3]Remove 1 (one) space [WL4]Add: (s) ? [WL5]One space needed? [WL6]One space needed too? [WL7]Add: s at the end of the word? [WL8]Replace this by: pp 495-496. [WL9]Replace this by: pp 135-138. 1 2 University of Portsmouth M.A. European Law and Policy, Intensive Course, April 2003 Emilija Jurakic, Wytze van Leuveren and Russell Petersen ...read more. However, in some cases, such as tax, parliament does not have to be a part of the process, the commission can simply pass the legislation on it's own accord. * The Power of the Purse. As this sounds, it is related to money. Denmark also supports greater subsidiarity in the EU - a concept which significantly translates into Danish as n�rhed (closeness). Following the EC membership in 1973, the politicians felt they had been given a mandate to enter into an increasingly close economic co-operation, but not an extensive political integration. at work and any other relevant issues that that has to do with the workers its selves. 9. Protection of children and adolescents - EU has strict rules and has taken the appropriate measures to make sure that no body is exploited especially children and adolescent. and horizontal effect should give rights to individuals in some cases and not in others. a poor history of open corporate markets due to their post-war soviet occupation. In June 1998, the European Commission were invited to prepare an action plan to develop the EU single capital market resulting in the Financial Services Action Plan, which was published in May 1999.
the requirements of the European law then it must be declared invalid and ineffective. This was elaborated in the case of Bossa v Nordstress Ltd  EAT. If national law conflicts with Community law then it must be overruled, this situation appeared in the case of Simmenthal v Commission  ECJ.